Knitters love yarn, all kinds of yarn. Thick yarns, thin yarns, soft yarns, and some even like scratchy yarns (but not this girl!) Having a hobby like knitting often means that the knitter acquires a stash of yarn to peruse at their leisure. But what does a knitter do if they are saving funds for say, a marriage, and does not have much (if any) stash yarn? Usually, they would yarn diet, or hope that someone is kind/thoughtful to gift them with yarn. Which is what I’m doing in the case of my Ravelry penpal Gavin, who lives in London, England. 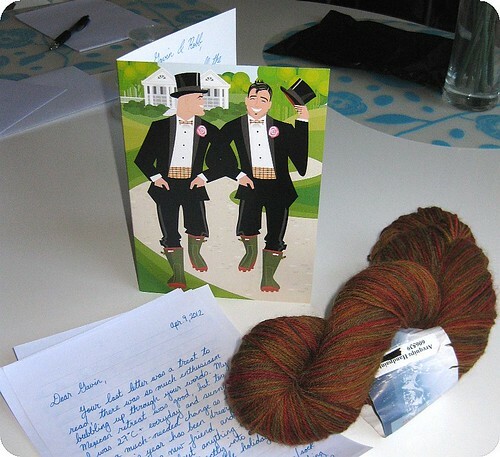 Gavin is getting married later this month and I snuck a look at his Ravelry stash and learned both from our letters and from his online notebook that he has 4 stash yarns. 4!! To compare, I have (ahem) 64 yarns stashed (although I am looking to trade/sell about 5 of them). Most of my stash has been collected over the years and from buying cheap lots either online or at my local wholesaler Dressew. 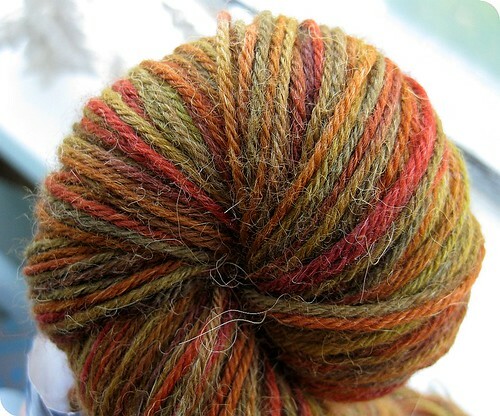 Its Arequipa Sock yarn, content being 65% Superwash wool, 20% Alpaca and 15% Nylon, in a lovely earthy colourway. I was having difficulties in the store where I purchased it because I couldn’t fully remember what were Gavin’s favourite colours. Luckily, I checked back on Ravelry afterwards, and his are “earthy tweedy” so I think I succeeded! Complete with really sweet card and handwritten letter, I hope he loves this gift. Now I just need to go to the post office and mail it! You are currently reading Giving the gift of yarn at When Gaia Smiles.